The hotel Hviezdoslav was opened to public on 6th April 2011. It was reconstructed and finished on the basis of EU funds contributions. Our hotel is named after great Slovak poet and writer Pavol Orságh Hviezdoslav, who privately lived in the house during his studies at the famous lyceum of Kežmarok. The memorial tablet hanging on the face of building shows evidence of it. 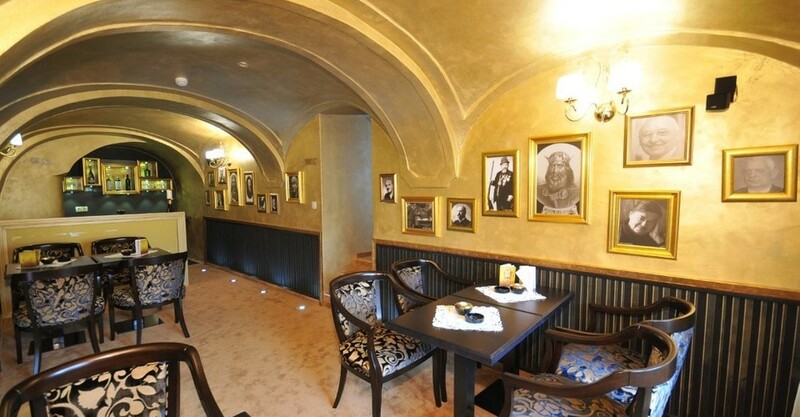 The hotel is situated in a historical object from the 17th century in a Renaissance burgher´s house built on Gothic foundations, which has been recorded in the General list of Monuments Fund of the Slovak Republic. The hotel offers accommodation in 8 comfortably and cosy equipped double-bedded rooms and in 4 elegant suites, 2 of which are furnished in historical style. The suites have convenient extra beds. The hotel accommodation capacity is 24 beds, including extra beds 32. In the hotel you can find a style restaurant Poetry, where we offer culinary specialties of Slovak gastronomy in stylish arrangement, but also the meals of international cuisine. When preparing meals we focus on seasonality of foodstuffs and willingly satisfy the needs of guests with health diet restrictions in catering as well. Except for restaurant there is also Literary coffee-bar having an interesting library and portraits of poets and writers who studied at our lyceum. Pleasant atmosphere of our coffee-bar enables our guests to savour a cup of good coffee, a glass of quality wine or refreshing mixed drink; to taste cakes and desserts from own production. During warm and sunny days the cosy summer terrace in hotel atrium is available to the guests, and which may be suitable for mothers and children. For sure you will visit our wellness centre Harmony to regain vitality and to have ideal relaxation. The wellness centre provides visitors with 4 kinds of saunas/steam, herb, Finish and infra- cabin/, Jacuzzi, relaxation room, ice rain and tapidarium, moreover various kinds of massages and relaxation compresses. The accommodated guests have 2-hour free wellness admission included in accommodation price; massages and compression are to be paid extra. The guests have nice and soft dressing-gowns and slippers or wellness bags at their disposal in the rooms. Car parking is included in accommodation price. We take care of the guests’ cars at the car park in hotel atrium with a surveillance camera. In the framework of good cooperation we secure horse riding and horse ride training for the guests on the nearby ranch in beautiful environs, the river Dunajec rafting, bathing in thermal water in Vrbov, in winter skiing and skiering and other interesting activities. It is possible to combine work with pleasure stay in cosy hotel atmosphere, and it is offered by our conference room, suitable for smaller conferences, seminars, sessions, business dealings, etc. It is equipped with necessary technique. During the dealings there is also offered a professional coffee break. Kežmarok was in the past a famous student township thanks to the known lyceum, to which on 11th September 1865 a young Hviezdoslav came to study the fourth grade. There was a notorious song about the town: “The town of Kežmarok was painted by a painter, to be sure, there are two hundred students for a red half cent. “ Hviezdoslav came to Kežmarok to improve his knowledge of German language. In picturesque environs of Kežmarok, against the background of majestic summits of the High Tatras there his perceptive soul soaked up the beauty of verses of Hungarian poets like Petöfi, Arany, then Goethe, Schiller, but namely of Shakespeare. Natural beauties, sensitive poetic heart and impressions from the read works made him to express his experience. Thus he recorded verses into a thick notebook, which breathed his self-reasoning, consideration on relation to the world, nation and tender love farewell. During his 5-year study in Kežmarok he received more stipends and the reasons for their granting and receiving were the same: poor background, excellent standing at school and great talent for poetry. During his studies Hviezdoslav lived privately in the house, where our hotel houses today. The stipends were not enough to cover all his expenses and costs for study, board and accommodation. That´s why he had to earn a little extra by giving extra lessons to worse classmates from rich families of Kežmarok. In such a way he got to the family of Július Demiány, a tradesman with ironmongery and wheelwright goods. There he saw luxury and plenitude of everything and increasingly he became aware of his poverty and it was very humbling for him. As the student of the fifth grade he became the member of Hungarian self-educative hobby group, and even with number of the most awarded works he became his secretary. In the school 1866/67 something suddenly broke inside the young Országh. What exactly happened, we would never learn any more. He tried to come closer to his rich classmates, but those did not accept him among them. He fell in love with a burgher girl, his classmate´s sister, whom he tutored in the family of Demiány. She showed him he was not equal to her. Or he hit it by himself? In Kežmarok the young student experienced great transformation, because he found here that except for Hungarian poets there are great poets in other literatures as well, that Slovak works hide precious ideas and the Slovaks have their past and literature. At that time he started to write his Slovak verses. Országh managed excellent all his grades. He had undeniable relation not only to human but also to exact sciences. It is then clear that he handed in the written school leaving paper in mathematics in ¾ hour earlier than the other students. The oral leaving exams consisted of 9 subjects. He as the only one of 27 students achieved excellent notes in all subjects. However he was not a bookworm, he liked to drop in the inn for a glass of beer with his classmates, doing so despite strict school ban, for what he repeatedly got to the school prison. During his studies in Kežmarok he issued as 19- year old student his 1st book of poetry named “Básnické prviesenky Jozefa Zbranského”- “Poetic Primroses of Jozef Zbranský”, which was dedicated to Andrej Sládkovič and he joined him as his follower. Having passed his leaving exams in 1870, Országh left Kežmarok for Prešov to study law there. The history of the house, in which at present our hotel is situated, dates back to the 17th century, when there from 1697 the family of a fellmonger Gaspar Heckel, who had a workshop and flat there, lived. The house was built in Renaissance style on the Gothic foundations. The house owner sold the house later to the family of honey-cakes baker Carl Hayde, who moved in the town from Levoča. The whole family pursued the handicraft of honey-cakes baking and art. Carl Hayde bought the nearby semi-detached houses no. : 47 and 45. In the 19th century the house was occupied by the family of Mária Kupferschmidt and Ferdinand von Cserépy, who was a reputable burgher of the town Kežmarok. In 1911 the house was bought by Andreas Szkladányi, a shopkeeper of fancy goods and a buttons maker. At that time the house was rebuilt in Classicist style with preserved Renaissance details. The mentioned family lived here approximately till 1970. Thereafter more inhabitants often change in the house, when after all it was sold to the family of Klempár on easy terms; his family lived here up to 2008. In the same year the family Klempár sold the house. In autumn 2009 the extensive reconstruction and finishing of the hotel began and it was accomplished on 30th March 2011. This building started its history on 6th April 2011 with opening ceremony upon participation of many significant personalities from the sphere of travel trade, hotel industry, public administration and media. In the course of our short existence on the market we were visited by several significant personalities of art, culture and clergy: film director Juraj Herz, the Babjak siblings, a violinist Peter Michalica, folk narrator Ander from Košice, and the staff of “Blue from the sky”- “Modré z neba” with V. Rozboril, Mr. A. Srholec from the clergy.